This 2-part epoxy kit, like most epoxies, is very easy to apply. This is made even easier by the fact that you can mix directly into the bucket. As a garage or basement floor coating, this is perfect; it’ll strongly resist wear from any tires or foot traffic. Sufficient coverage for 250 square feet, so you can cover a single-car garage. Larger areas require more than one kit to finish. 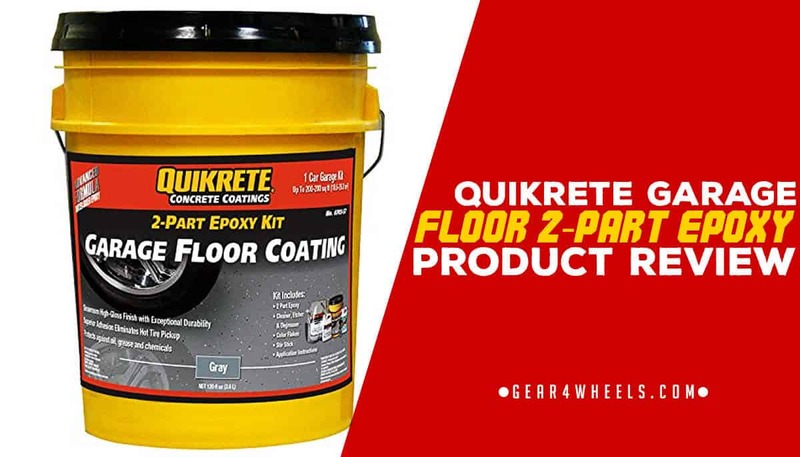 This 2-Part Epoxy from Quikrete Coatings is perfect for offering a superior finish and exceptional durability to your indoor concrete flooring. It’s roughly in-line with other products price-wise, but Quikrete are known for their quality products, so it’s a brand that you can trust. 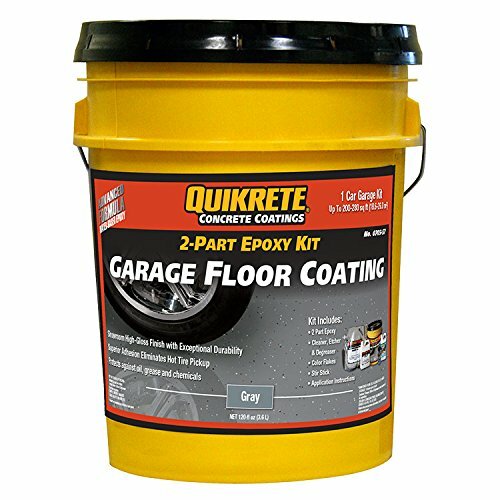 The Quikrete Concrete Coatings 2-Part Epoxy Kit is a water-based epoxy that is perfect for affording long-lasting protection to your garage floor, or other concrete surface. With the ability to resurface your garage floor in a gray or tan epoxy, this kit is packaged into a bucket that is perfect for mixing. As a concrete coating, this epoxy kit is well-suited to repainting a range of surfaces, including garage floors, basement floors, other indoor floors, and both bare and painted concrete. It's worth noting that for surfaces with existing paintwork, you'll need to ensure that the paint is secure, not peeling, and that it is not oil-based. Given that the range of floors suitable for this epoxy include garage and basement flooring, it's ideal for home-use. With or without color flakes, the glossy finish affords a stunning appearance for the normally less looked after areas of your home. It’s less suited to commercial use, not because of the price or durability of the product, but down to the coverage offered by a single kit. According to the manufacturer, there's sufficient epoxy compound included within this kit to cover a one-car garage of standard size, up to 250 square feet. Your 2-Part Epoxy compound is literally a combination of 2 chemicals that come together to provide the glossy finish and durability promised by epoxy finishers. A tinted epoxide resin and a polyamine hardener are both included and should be combined at the point of preparing for the application. However, prior to the application, you'll need the Quikrete Cleaner, Etcher and Degreaser, which is also a component included within the bucket-shaped package. This is the first product you’ll lay down, which both cleans and degreases the surface, ready to receive its epoxy compound. The etching process allows the surface to be treated prior to painting, which encourages greater adhesion by the epoxy. Finally, the package also includes Quikrete Color Flakes, which can be used on the freshly painted surface to improve the appearance and give it a professional finish. These flakes, which are black and white in both the gray and tan products, provide a showroom appearance on your surface. They should be evenly laid on the surface after application. It’s worth noting that that the clever design of the packaging means that you can mix your 2-Part epoxy directly into the bucket that forms part of the packaging. This can be done using the stirring stick, which is also included out of the box. This floor coating also comes with a warranty, though explanation of the eligibility criteria is limited, stating that it doesn’t cover 'any purpose or use other than the general purpose for which it is intended.' Further contact with the manufacturer is required if a defect is found or suspected. Quikrete provides everything you’d expect from an epoxy floor coating kit, with everything included being at least on par with other manufacturers. The bonus here is the inclusion of a stirring bucket that can be disposed of after use; no more trying to find a spare container to prepare your epoxy compound. You’ll have enough paint to cover a single-car garage or 250 square foot basement with ease.